It cleans, degreases and polishes surfaces in stainless steel and aluminum matted and damaged by use. 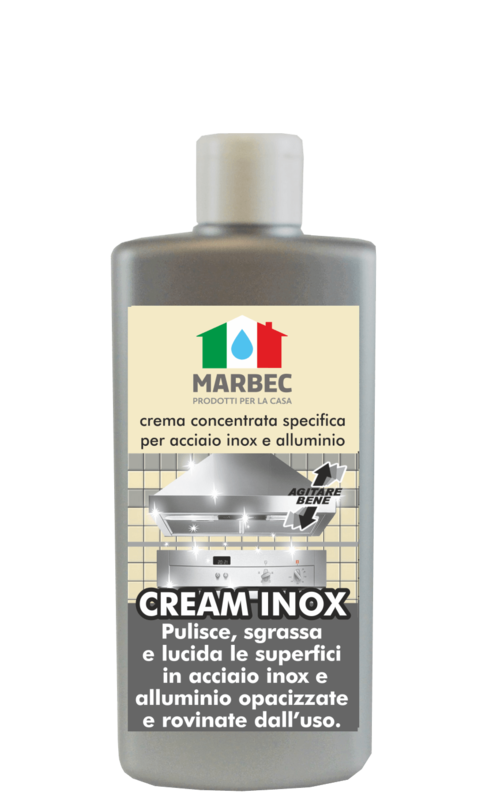 CREAM INOX is a specific cream for the cleaning of the surfaces of the house in stainless steel and aluminum (electrical household appliance, steel floors and kitchens, etc.). It cleans, degreases and polishes the surfaces opacified by use, bringing the material back to its original appearance. It contains no acids or alkaline substances, it does not leave stains after use and it does not exhale harmful fumes. Shake well before use. Pour a small amount of product onto a damp sponge. Rub the surface to be polished until a dark patina is formed. Rinse with water. Depending on the concentration of use. Universal cleaner for all surfaces Product perfectly cleans glass, polished stone, ceramics and shiny surfaces….